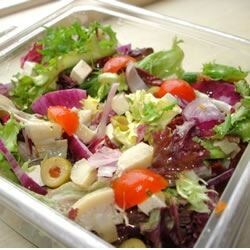 This is a delicious salad that goes great with any meal. Heat a large skillet over medium-high heat. Place the almonds in the skillet, and cook, stirring frequently until lightly browned. When the almonds are beginning to turn, add sesame seeds, and cook 1 more minute, or until seeds are toasted. In a large salad bowl, combine lettuce with feta cheese, olives, almonds, sesame seeds, tomatoes, onion, mushrooms, and Romano cheese. When ready to serve, toss with Italian dressing.